Marc Girardelli was perhaps the most gifted all-rounder of modern times and certainly the greatest alpine skier never to have won an Olympic gold medal. He won five overall World Cup victories and a hatful of titles in a glittering career that spanned over a decade. Girardelli's 46 World Cup victories included wins in all five disciplines, and his success came during a period when rivals of the calibre of Ingemar Stenmark, Primin Zurbriggen and Alberto Tomba were all at their peak. 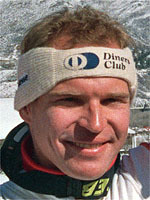 During the 1988-1989 season he made alpine skiing look almost easy, winning races in four different specialities (downhill, slalom, super-G and giant slalom). Born in the Austrian ski-resort town of Lustenau in the Voralberg province he left Austria in 1976 for Luxembourg where his father had settled following a disagreement with the Austrian Alpine Skiing Federation over training methods for his son. Deprived of the massive Austrian coaching machine, Girardelli had only his father's wisdom to fall back on, but this did not stop him taking part in his first World Cup event at the age of 16. His Olympic debut was hindered by delays in obtaining citizenship in his adopted country and it was only in 1984, at Sarajevo, that he first entered the Olympic fray. This proved to be a minor stumbling block and Girardelli went on to win 13 world and Olympic medals, although silver was as close as he got to the top podium at the Winter Games when he had to settle for second place in the super-G and giant slalom at Albertville in 1992. Despite starting a remarkable 437 races, his 17-year career was often hindered by injuries and he was forced to undergo surgery on his knees on no less than 14 occasions. Since the 1988-1989 season when he became the first man to win races in all disciplines (excluding the combined) in the same season, his mark stood until the American Bode Miller equalled the feat in 2004. In February, 1997, in the middle of the World Cup season, he abruptly announced his retirement in order to spend more time with his family as well as pursuing his hobby as a helicopter pilot.